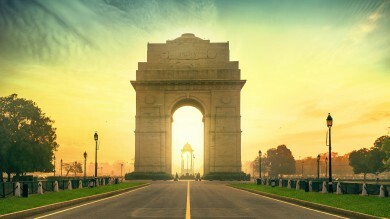 Delhi and Agra make up two of the three points in India’s Golden Triangle, so travel between the two cities is common. Especially since Agra houses India’s greatest claim to fame, the Taj Mahal. There are multiple transportation options to get from Delhi to Agra. If you are in one city, you should definitely take the time to discover the other. The things to do in each place vary greatly and they are conveniently located in close proximity to one another. If you’re planning a trip to Delhi, make sure you read this article on how to travel to Agra and take the time to experience two of India’s most fascinating cities. There are a lot of trains that go from Delhi to Agra. They run on a daily basis, but the duration of the journey varies quite a bit. It can take anywhere from nearly 6 hours to less than 2 hours, however the most popular routes typically take between 2 to 3 hours. The difference in duration is mostly due to the speed of the train and the number of stops. There are two railway stations in Delhi with trains to Agra. The main one is New Delhi Railway Stations (NDLS) and is roughly 1 hour from Delhi’s primary civilian airport, Indira Gandhi International Airport (DEL/VIDP). The other one, Hazrat Nizamuddin Railway Station (NZM), is more convenient for those staying in the southern area of the city. It’s a little over 1 hour from Indira Gandhi. The trains that originate in Delhi and go to Agra are Bhopal Shatabdi, Karnataka Express, Kerala Express, and Gatimaan Express. Among them, the latter is the fastest train to Agra (new in 2016), arriving in 1 hour and 40 minutes. There are multiple other trains that pass-through Delhi on their way to Agra as well. Cost for trains varies on company, duration, and seat class. The cheapest seats start at USD 5 – 10. First class seats are between USD 15 – 20*. Agra Cantt (AGC) is the main arrival station in Agra. There are a variety of scheduled trains between these two train stations. The first train leaves from Delhi at 12:10 am and the last train leaves at 11:55 pm, ensuring you can get from Delhi to Agra at any time throughout the day or night. Bus is a very commonly used mode of transportation in India. There are over a dozen operators offering the Delhi to Agra by bus route. On average, the duration is around 3 – 4 hours and a variety of seats from the most basic to the most comfortable are available. The earliest bus leaves at 6:00 am and the latest leaves at 10:40 pm. There are multiple options for boarding points in Delhi. It depends on the bus company and the route taken. Some of the most popular stations are Sarai Kale Khan, Kashmiri Gate Metro, Akshardham, and Mahamaya. Other examples of boarding points are bus ticket shops, malls, and numbered bus shelters. Be sure to take good notice as to where you are to board the bus when you purchase your ticket. There are about 6 dropping points in Agra. Some of the most popular ones include Agra I.S.B.T., Agra, M.G. Road, and Kuberpur Sunny Dhaba Agra. A/C and sleeper seats are available. Costs for seats vary widely based on the operator and seat. The average for the cheapest seat is around USD 4. The most expensive seats are around USD 15 – 20*. Road tripping from Delhi to Agra by car can be a fun alternative to public transportation. Keep in mind that when you rent a car in India, much of the time a driver is included. If that’s not part of the deal, you might want to consider hiring one. Having a local driver can be really beneficial when it comes to navigating the roads and driving etiquette in India. Car rentals in Delhi start at around USD 30 for a one-way trip to Agra with a driver, plus USD 0.14* per kilometer. This includes the cost of tolls and state tax. Hiring a taxi from Delhi to Agra costs around USD 32 for the most basic car and about USD 45* for a luxury SUV. Surprisingly, flying to Agra from New Delhi is not much more than renting a car or hiring a taxi. On average expect to pay between USD 30 – 50* for a one-way flight. There are multiple daily flights from Delhi to Agra, however be sure to check the duration of the flights carefully. Some have multiple stops and/or can take up to 23 hours to complete due to long layovers. Flights leave from Delhi’s Indira Gandhi International Airport and arrive to Agra’s Kheria Airport. Air India is the most popular airline providing flights from Delhi to Agra. Flights with one layover typically take around 3 hours from start to finish. Don’t forget to factor in the time it takes to get to and from the airports. While flying may seem easier, in the end it might not be much faster or more convenient than taking a train or driving! 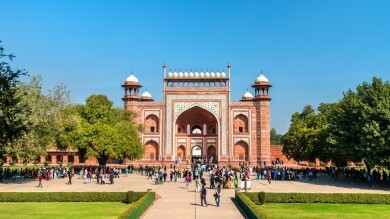 This 3-day tour starts and ends in Delhi and takes small groups of travelers to iconic sites in Agra like the Taj Mahal, Red Fort, and the deserted city of Fatehpur Sikri before returning to Delhi to sample the local cuisine and shop the famous markets. 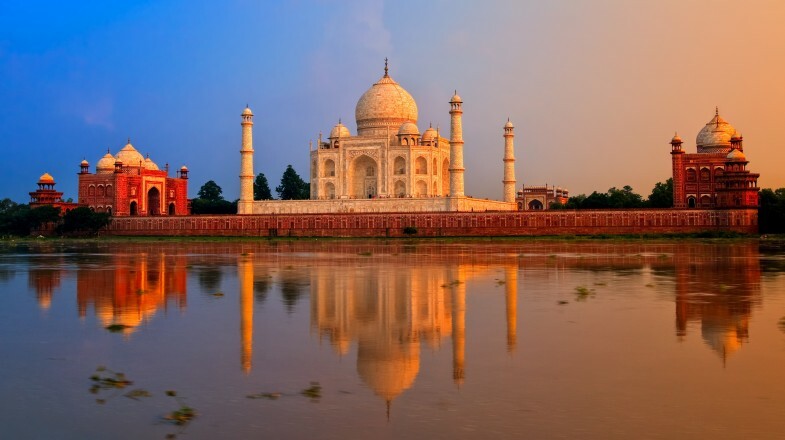 This Delhi to Agra one day private tour leaves from Delhi early in the morning and arrives in Agra with enough time for a guided tour of the Taj Mahal and Agra Fort before heading back to Delhi the same day. Perfect for those short on time but want to see the most! Another one day tour private tour that visits the Taj Mahal and Agra Fort with the option to leave either the morning or afternoon. 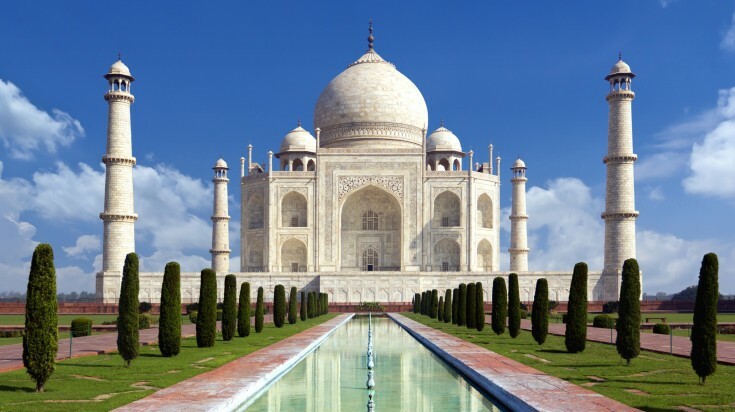 Options to get from Delhi to Agra vary from car transport, flights, trains, or private tours. The best choice for you will depend on your schedule and comfort preferences. Regardless of the mode of transportation you choose, Delhi and Agra are sure to delight and inspire with fabulous food, frenzied markets, and world-famous sites. *Note: Prices are as of October 2018.